Meet Budleigh, 30 this year! He is thoroughly enjoying retirement and being spoilt rotten. I’ve owned him since he was seven. We competed in dressage in his youth, from preliminary to advanced. I love him to bits! This is Nutty, she is 23 years old. I got her when she was 18 months as a rescue. She is now having a quieter life as a very special RDA pony. 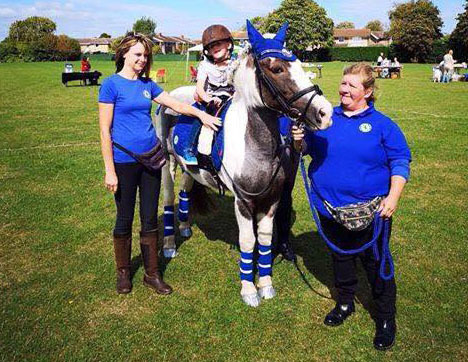 She is amazing at it and everyone adores her, she even went to a fundraising day to help raise money for a little boy called Joey who has cerebral palsy (pictured on Nutty) and to raise awareness of what an amazing job the RDA do for the riders and also their parents and carers. This is Minnie the moose, she’s 34 years old, I’ve had her since she was 7. She’s completely nuts, has all her own teeth and just yesterday trampled over me in the gateway as she galloped away as I deigned to let her out into her field an hour late! This is my 25 year old I’ve had him for five years and love the bones of him! He’s still in full work, we compete in Dressage regularly, still loves to jump, and acts like a five-year-old when he’s going out for a good gallop. No signs of slowing down! Gem has been part of my life for 23 years, she will be 31 in March. We have competed at absolutely everything. Our highlights include making it to Olympia and Hickstead, but having lots of fun along the way! 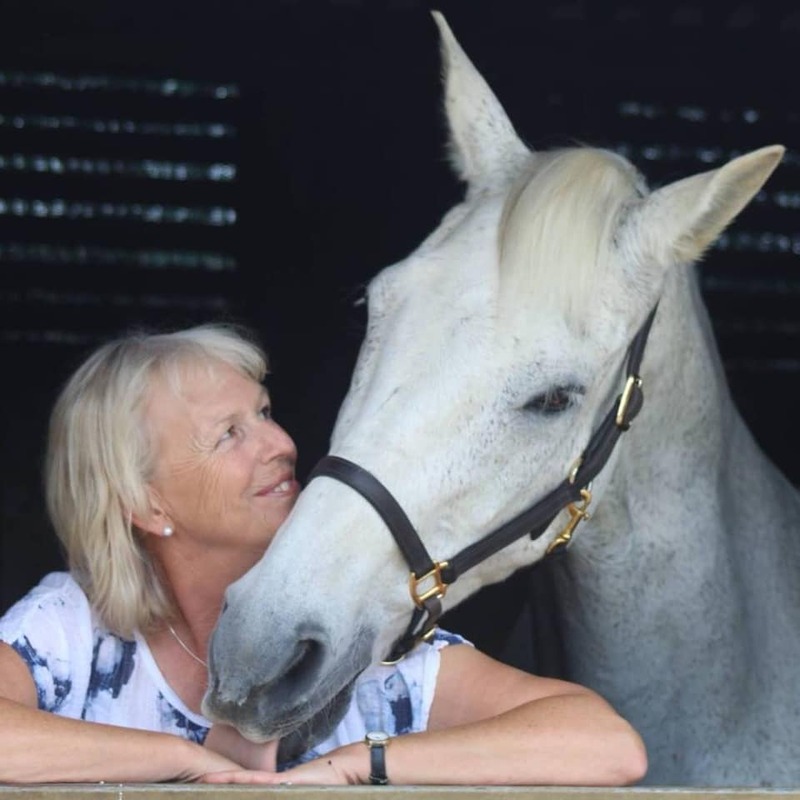 She is my everything and testament that if a horse is looked after well they can continue to offer so much in return. This is Roving Chieftain, he is 25 years old in May. He is homebred and we lost his mum when she was 34 and was still in light work. He is fit and well and competing at British Dressage Elementary. He still has his ‘moments’ and can show off like a four-year-old. He is a true gentleman and is a pleasure to have. Here are Tig and Charlie. Tig is 27 this year and I bought him at the Builth Wells sales when he was three and a half. With him is Charlie the Shire, who is 26 years old and we’ve owned him for 18 years. Both are still ridden, in particular Tig, who gives pony rides to my grandchildren. Dina is 18, Arabian, a retired broodmare and now a beautiful pet. I bought her 10 years ago to breed my dream foal from. She is retired from ridden work due to arthritis and broodmare duties due to colic surgery, but she’s a very happy field ornament still living with her now eight-year-old daughter. This is Basil, he is now nearly 30. I bred him and was with him when he was born in 1989. He’s retired but is our big cuddly teddy bear much loved by all. This is Velletta, she will be 25 in June. She loves to go out on the moors and does not act her age. I bred her, in fact she is the fourth generation which my family has bred. I also have her son who will be eight in May. This is Doonbye Royal Blaze and he will be 33 in April. l've owned him his whole life – I was even there when he was born as l owned his mum. I broke him in myself and he's done everything from eventing to endurance. I sadly retired him last year due to arthritis and he is now a very happy, expensive field ornament! Read the full article about celebrating veterans in issue 449.